Okay, so with the cooling temperatures and changing aspens comes my appetite for hot soups and stews – things I generally avoid during our warm months. 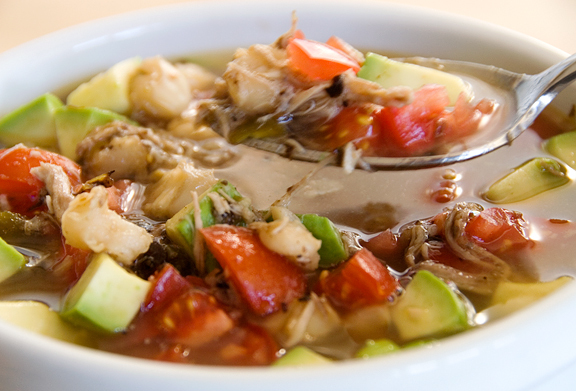 Posole is incredibly simple and yet it produces such a satisfying and hearty meal. 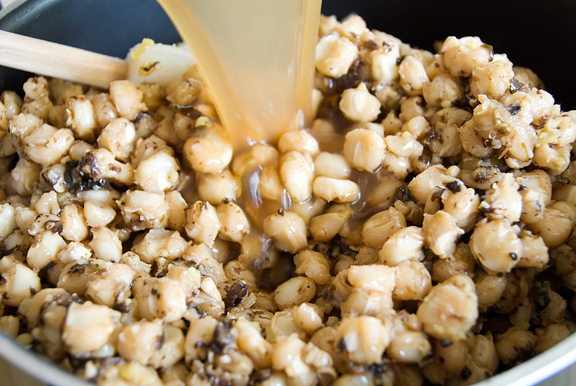 It is named for the star ingredient: hominy or posole. I use whole dried red New Mexican chile pods for this stew. I’ve substituted with other dried chiles before and I didn’t like them so much. So if you can get your hands on some New Mexican reds or bribe a friend in the state to send you some, it’s worth the trouble. I also like to add roasted Hatch green chiles (of New Mexico – see a pattern here?) at the end of the cooking. The whole recipe is fairly straightforward: dump most of the ingredients in a pot and cook for a long time. I add a few more annoying steps just because I prefer to defat the stew and skin my chiles. My extra steps mean that the stew takes at least a day to make. If you plan ahead, it’s really quite simple. After cooking the posole, I remove the red chiles and split them open with a sharp knife. I scrape all of the chile meat from the skins and chop it up very fine. 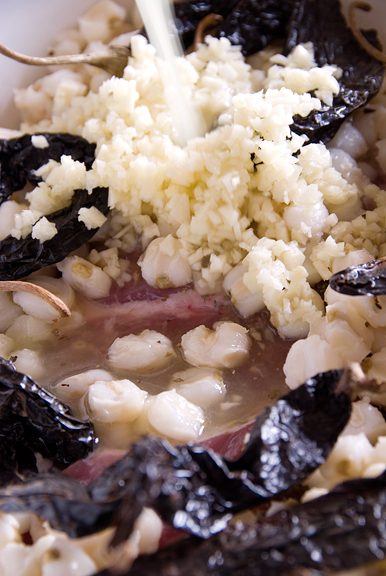 Next, I remove the pork from the broth and pull off all of the meat, throwing away the bone and any fat or connective tissue. I shred the pork and set it in a tupperware in the fridge. Finally, I strain the broth and store it in a glass bowl for refrigeration. I store the remaining posole, garlic, and chiles in the same tupperware as the pork. When the broth is cooled (this I usually do overnight) there should be a soft layer of fat on top that you can easily remove and discard. After reuniting all of the stew ingredients in a large pot, you can heat it up and serve. I like to garnish with diced tomatoes and avocado. Jeremy likes to have a bowl of posole with a warm flour tortilla or two. First method: Put pork, hominy, lime juice, and red chiles in a pot. Fill with enough water until all ingredients are covered. Bring to boil then cover. Simmer for 3 hours (add water as needed). Stir occasionally. Add garlic, oregano, salt, and green chiles. Simmer for 30 minutes. Second method: Dump everything except the salt and green chiles in a crock pot. Set on high for 7 hours. Add salt and green chiles and let cook for another hour. 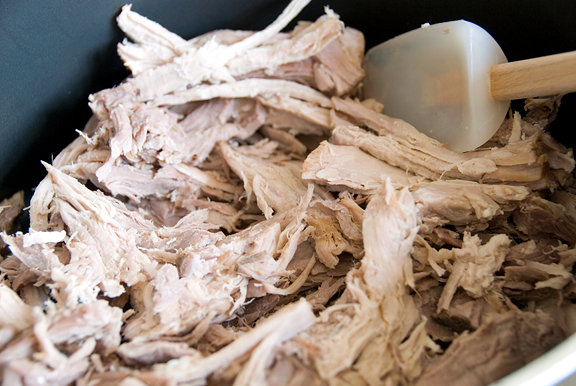 Both methods: Remove pork and shred it. Set aside. Remove red chile pods and slice open, scraping the meat from the skins. Discard skins. Chop the red chile meat into a paste and add to the pork. Strain the broth and add the solids to the pork and store in refrigerator. 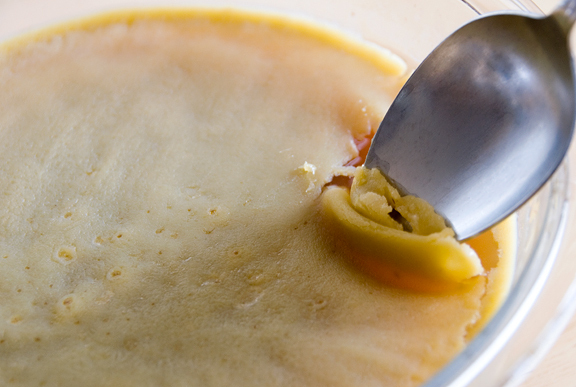 Store broth in glass bowl and refrigerate until fat solidifies. Remove fat, discard. Return the broth to the solid ingredients and reheat. Serve with diced tomatoes, avocado, and warm flour tortillas. this looks really lovely jen. 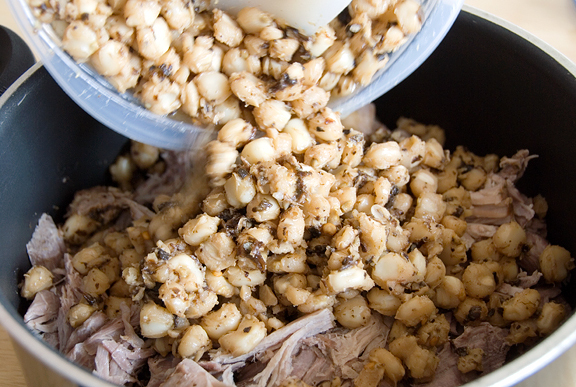 i wonder if i can get hominy in london… now that i know what it is! Abby – If you cannot find it, you may be able to mail order it online in dried form (I want to try that next because it’s much cheaper than canned). Don – Teresa would probably know better than I since I haven’t used Adobe Milling before. Try contacting them via their website. Doesnt look any different from the posole I get here in CO, where in CO are you that you cannot get good Mexican food? My coworkers are majority hispanic and when there are pot lucks they would usually bring a big pot of pizole. Theirs is more traditional where they stew pork hocks and add such things as tripe and fatty skin. it is often served with thinly sliced radishes, cabbage and finely diced yellow onion. Good! Delicious meal! My family would so enjoy this, thanks for sharing it! I love posole and plan to make it for our father’s family gathering, as he was born on Cinco de Mayo in 1915. Does anyone know what posole ingredients are sold at Winco? What would be their best chilies? Do they sell dried corn? cumin. If I try that one, as well, does Winco sell Mexican oregano? Thank you for any information you can share. Happy cooking and sharing and eating!